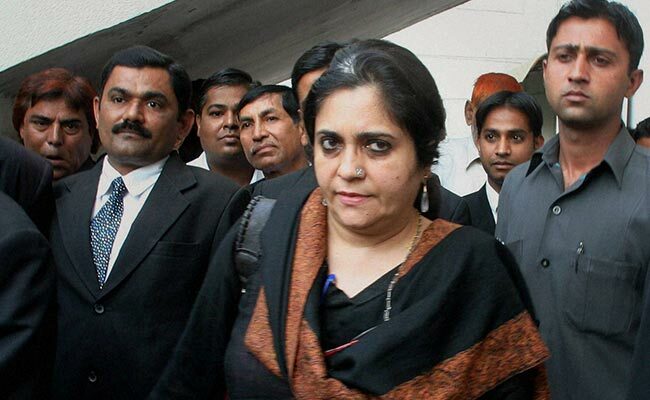 A case has been filed against Teesta Setalvad and Sabrang trustees by Ahmedabad Crime Branch on Friday night. A former associate alleged that Teesta Setalvad and Sabrang Trust tried to "mix religion with politics"
Ahmedabad: Social activist Teesta Setalvad has been booked for allegedly securing central government funds worth Rs 1.4 crore fraudulently for her NGO Sabrang between 2010 and 2013, the police said today. A case has been filed against Ms Setalvad and Sabrang trustees by Ahmedabad Crime Branch on Friday night on the basis of a complaint lodged by her former close associate Raees Khan Pathan, the police said. "We had received a complaint alleging that Setalvad and the trustees of her NGO, Sabrang Trust, used fraudulent means to get funds of Rs 1.4 crore from Union HRD Ministry between 2010 and 2013. Based on that, we registered an FIR against her and trustees of the NGO," said Additional Deputy Commissioner of Police (Crime Branch) Rajdeepsinh Zala. According to the complainant, Ms Setalvad's NGO, which was given the grant for educational purposes, also distributed printed materials that could cause communal disharmony, Mr Zala said. The accused were booked under various sections of the IPC including 403 (dishonest misappropriation of property), 406 (punishment for criminal breach of trust), and 409 (criminal breach of trust by public servant, or by banker, merchant or agent) besides under relevant sections of the Prevention of Corruption Act, he said. Mr Pathan had alleged that Ms Setalvad and Sabrang Trust tried to "mix religion with politics" and spreading disharmony through the curricular material prepared for the erstwhile UPA government which had given it a grant of about Rs 1.4 crore. The complaint had taken into account the report of a panel of the Ministry of Human Resource Development which in its finding, has claimed that a prima facie case existed against her under section 153A and 153B of the IPC for promoting enmity on grounds of religion and making imputations and assertions, prejudicial to the national integration. The sources said the Crime Branch of Ahmedabad police had sent a communication to the deputy secretary of the Department of School Education and Literacy under the Union HRD Ministry, urging it to "furnish a point-wise reply on the application/ complaint at the earliest." The HRD Ministry in 2016 had sought the opinion of the top law officer endorsing the report of its three-member committee, saying "the report of the inquiry committee is exhaustive and deals with every aspect of the matter and that action as suggested in the said report may be undertaken in terms of fixing liabilities/lapses, action for inciting disharmony and hatred and also for recovery of the money as is stipulated in the scheme itself". Mr Pathan had filed the complaint last November with the Ahmedabad Crime Branch on the basis of the report against Ms Setalvad, her husband Javed Anand, officials of the Sabrang Trust and unknown officials of the HRD Ministry. He had sought investigation into the alleged offence of criminal conspiracy, criminal misappropriation of property, criminal breach of trust by public servants, promoting enmity between different groups on the ground of religion, among others. Mr Pathan had alleged that a large amount from the HRD funding was used during 2008 to 2014 on 'Khoj' project of the Sabrang Trust under the scheme of 'National Policy on Education' in Maharashtra and Gujarat as well as on the 'Peace Building and conflict resolution' project. The project was launched by Setalvad's NGO in some districts of Maharashtra and Gujarat. Mr Pathan had also claimed that a three-member panel, comprising Supreme Court lawyer Abhijit Bhattacharjee, Gujarat Central University Vice Chancellor S A Bari and HRD ministry official Gaya Prasad, had confirmed that the then officials of HRD Ministry in connivance with the trustees of Sabrang Trust illegally sanctioned the funds under the 'Sarva Shiksha Abhiyaan'. "Large amounts were also transferred as donation from Sabrang trust to Citizens for Justice and Peace (CJP), another NGO of Teesta Setalvad which too was used for various activities such as payment of salary to office staff in Gujarat, travelling expenses to riot victims of Gujarat, advocate fees and on various campaigns launched in Gujarat against the state government," Mr Pathan's complaint had alleged.